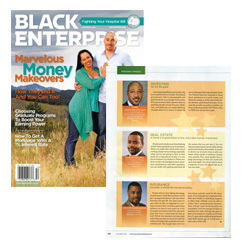 Check out the October issue of Black Enterprise! I really want to say THANKS to you guys! Because of your support, lots of cool things have happened this year! I was featured in the October issue of Black Enterprise Magazine in their annual “All Star Advice” article. The good folks from BE gathered a group of financial professionals to answer questions on various topics of interest. It was very cool to be in the magazine, and I hope you all heed the great advice in the article. Congratulations my friend, glad to see you doing big things. You are making all of us very proud. Did you hear about 50 Cent making millions from pennies, I thought for sure I would see this on one of your updates, check it out.